LOCATION.--Lat 41°39'11", long 73°52'21" referenced to North American Datum of 1983, Dutchess County, NY, Hydrologic Unit 02020008, on left bank 700 ft downstream from Red Oaks Mill dam, and 4.5 mi northeast of village of Wappingers Falls. PERIOD OF RECORD.--May 1903 to June 1905 (monthly discharges and daily gage heights only, published in WSP 97, 125, 166, and 202), August 1928 to current year. REVISIONS HISTORY.--WSP 741: 1932. WSP 1902: Drainage area. GAGE.--Water-stage recorder and crest-stage gage. Datum of gage is 114.37 ft above NGVD of 1929 (levels by Corps of Engineers) and 133.52 ft above NAVD of 1988 (VERTCON). May 1903 to June 1905, nonrecording gage at site 2.5 mi downstream at different datum. 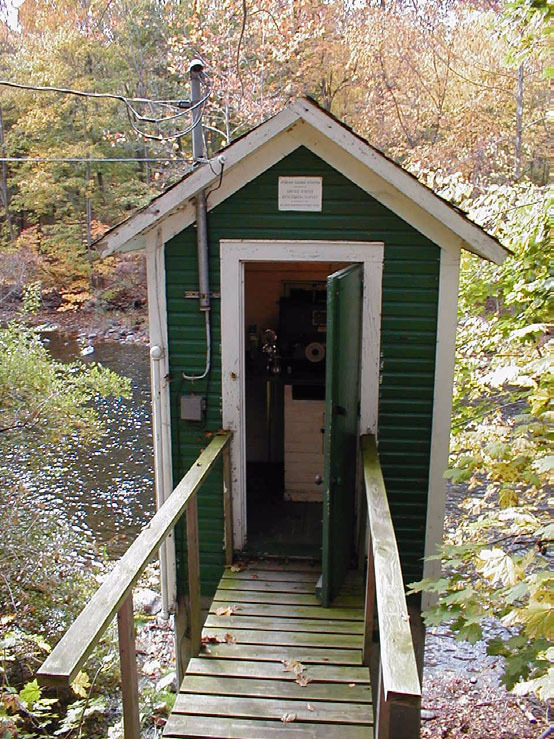 Aug. 7, 1928 to Sept. 25, 1931, water-stage recorder at site 2 mi downstream at different datum. EXTREMES FOR PERIOD OF RECORD.--Maximum discharge, 18,600 ft³/s, Aug. 19, 1955, gage height, 19.60 ft, from floodmarks in gage shelter, from rating curve extended above 7,200 ft³/s on basis of flow-over-dam and contracted-opening measurements at gage height 18.02 ft and contracted-opening and flow-over-road measurement at gage height 19.60 ft; minimum discharge, 0.90 ft³/s, Sept. 20, 21, 1964, gage height, 2.05 ft; minimum gage height, 1.96 ft, Sept. 9, 1995.